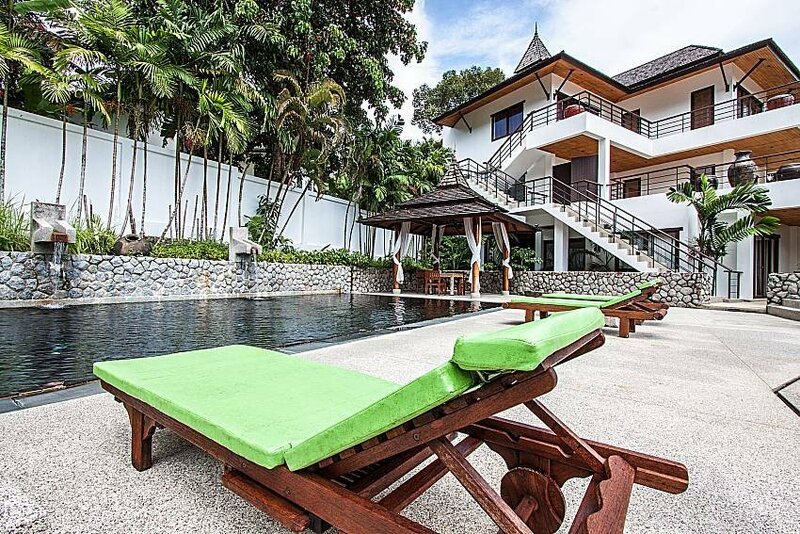 This utterly charming upmarket studio with top-notch wooden fittings is suitable for a couple or a single traveler looking for a great value rental in Phuket. Providing everything one might need on a perfect island escape, the 1-bedroom condo with a luxurious bathroom, full kitchen and a private balcony embodies the notion of nature and harmony. It is beautifully appointed with highest quality wooden furniture, perfectly matching the tropical environment. The development is overseeing nearby golf courses and featuring two lovely swimming pools and a gymnasium. The studio has both an indoor and outdoor dining table, a small office corner, plenty of closet space and TV with DVD player. There is a sizable bathtub in the bathroom, and the separate kitchen is small but with every appliance needed for a smooth meal preparation. The estate also provides full time security, safe parking, free Wi-Fi and daily maid service. In addition to a spa, few 24/7 stores and eateries that are reachable on foot (600-700 meters away), local attractions include Kathu Waterfall, Flying Hanuman Zip line Adventure, and a couple of golf courses. The nearest beach is Patong, about 7 km away.